Deals Powerful damage to all enemies. Increases Party's Buster Performance and NP Damage by 10% while she is on the field. 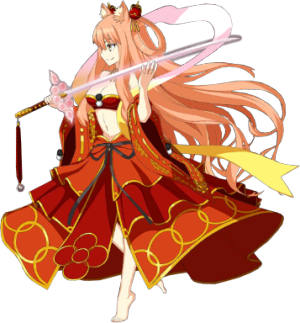 A dancing princess that made her stronghold on Mount Suzuka during the Heian era, and worked to defeat oni together with Sakanoue no Tamuramaro. Her beauty and strength made her a resplendent beauty worshipped as celestial maiden and demon alike. 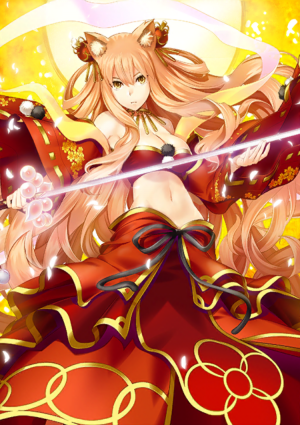 But her true identity is that of the beloved daughter of the Fourth Heavenly Demon King, sent from the heavens. 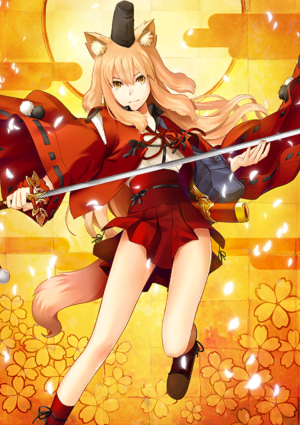 Suzuka Gozen received an order to turn Japan into a demonic country when she descended, but satisfied herself with nothing more than throwing the land of humans into confusion, and after many adventures, at the end of a tragic love, she was defeated by her lover, Sakanoue no Tamuramaro. ―――Uh, my lady. Is that really alright? Origin: The Scroll of Suzuka, Tamura Three-Generation Records, etc. 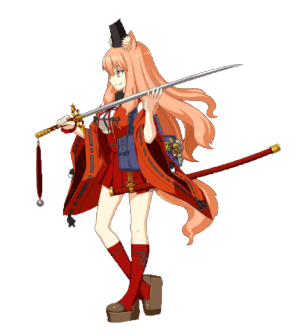 Of course, her height does not include her fox ears. A talented woman that is acting 『seriously』 as a selfish, short-sighted, gyaru-type high school girl. Her original personality is the opposite of a JK, being a deep thinking, understanding and elegant lady. As a celestial demon princess she can display cruelty, and she takes pride in shouldering her own duties and responsibilities with gravitas. On the other hand, that seriousness and intelligence has been suppressed by her rebellious trait of being an "oni's daughter", and intoxicating herself, a rather shady side to her personality is also present. She can be described as a multi-talented class president with a dark side, but that nature has been covered up well thanks to her JK act. It is more properly called Manjusri's Sword of Wisdom Great Gateway (Monjyuchiken Daitouren). 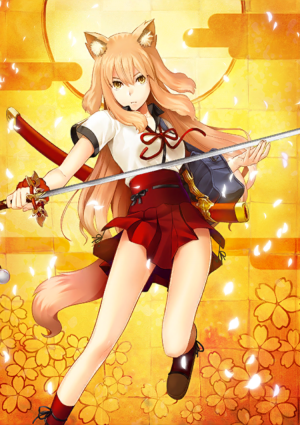 A divine power where her beloved sword, Daitouren is split into 250 blades and rained down mercilessly on the enemy. In life, the Daitouren was a couple's sword and when paired with the husband sword Sohayamaru in a combined technique, up to 500 blades could be rained down on the target. Now, by likening the hairpin of her reminiscences to Sohayamaru, letting it come into contact with the floating Daitouren will activate Tenkiame. Although the precision of the attack is fairly inaccurate, when "Blessing of Wisdom" is activated at the same time fine control such as "fall on everything around me except myself" can be achieved. A portion of the power of the gods. Able to move objects in the vicinity freely. 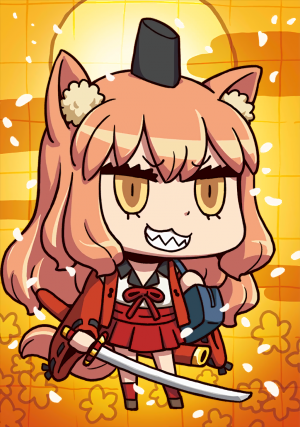 However, as she is currently materialized as a Servant, the ability has been ranked down and the targets restricted only to objects that she owns. Eyes that can fascinate men and instill strong romantic emotions towards Suzuka Gozen. Can be avoided with Magic Resistance skill. A verdict on whether that body has a divine attribute or not. 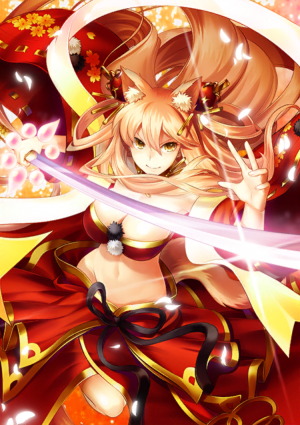 As the daughter of the Fourth Heavenly Demon King, Suzuka Gozen has high aptitude for Divinity. A skill that was originally used as a Noble Phantasm. 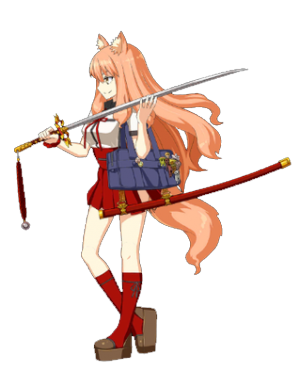 It is a Noble Phantasm where INT can be greatly increased by equipping the Shoutouren sword, which is said to have struck the Bodhisattva of Wisdom. Messy swordplay becomes more precise, and the knowledge of tactics increases vastly. It has many benefits such as 「Heavenly Demon's Rain」 performing better and 「Trichiliocosm」 becoming usable, but because her head needs to work more than usual, she will temporarily regret her inefficient lifestyle of play-acting a high school girl and fall into self-hatred. Therefore Suzuka Gozen absolutely doesn't want to use it. 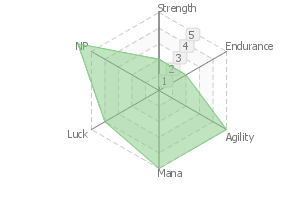 A skill that would originally be treated as a Noble Phantasm. ...Suzuka Gozen refuses to explain what sort of meaning this has. If used for a long period of time, her qualifications as a Heroic Spirit will be revoked. This page was last modified on 24 July 2018, at 02:04.